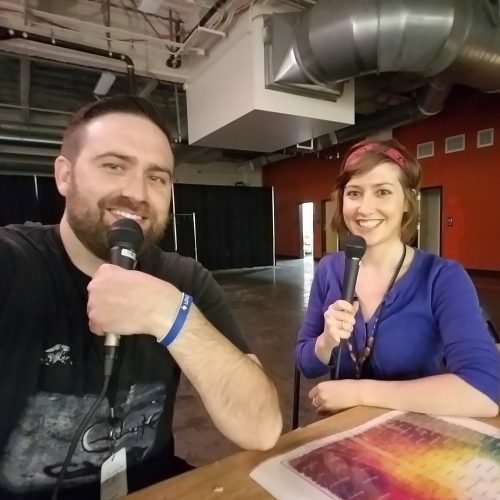 Brian found me at the Northwest Chocolate Festival last year and asked if we could record a podcast episode together. The next day we found a couple of chairs backstage of the festival, grabbed a Taste With Colour® Chocolate Tasting Flavour Map and hit record! In this unscripted episode, Brian and I discuss Taste With Colour® and go off on a few nerdy tangents including sugar, vanilla, the Maillard reaction, “raw” chocolate, naturalness and more! Click here or the image below to listen from the Chocolate Podcast website, or click here to play in iTunes. Brian and I posing with the mics after recording the episode!